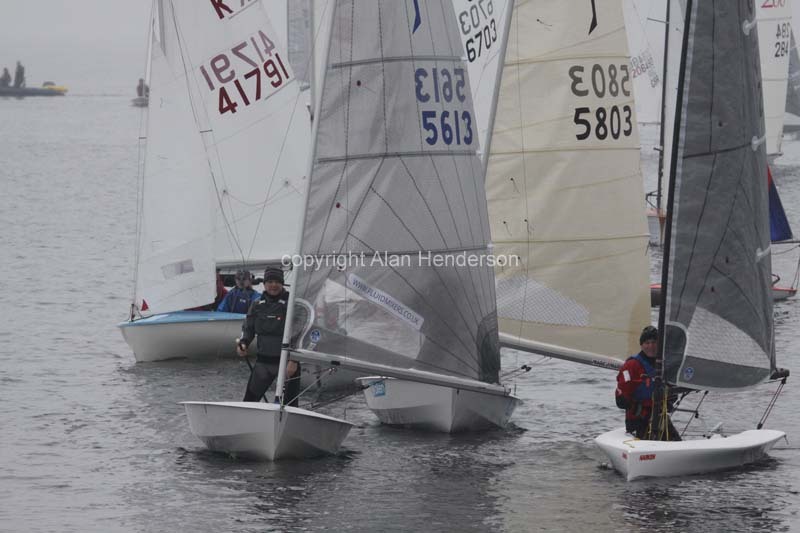 NEW YEAR RACE - SUNDAY 6th JANUARY - The New Year's Racing at Largs SC took place in a light, damp, southerly breeze which - more or less - remained constant enough for three windward leeward races to be held, in quick succession, over the same course. A fleet of 36 assorted dinghies made up the one handicap class, twelve of these were visitors to the club. The Race Committee had the unenviable task of setting a course length for a huge range of boats - from Optimists to A Class Cats - and then calculating results on an average laps basis. The Cats often sailing three laps to the Optimists one! The club house at Largs now boasts a new set of LED starting lights and a marvellous two tone horn and these were used to good effect with the along shore breeze allowing a starting line to be laid straight out from the club. The fleet managed three excellent starts, with only one boat over the line, but no one hanging back. The beat was into the tide with a dogleg around the marina safe water mark which added an interesting pinch point halfway up the leg. The two big cats, a Hurricane and A-Class, soon broke free from the pack but, in the light conditions were unable to power up enough to sail to their handicap. 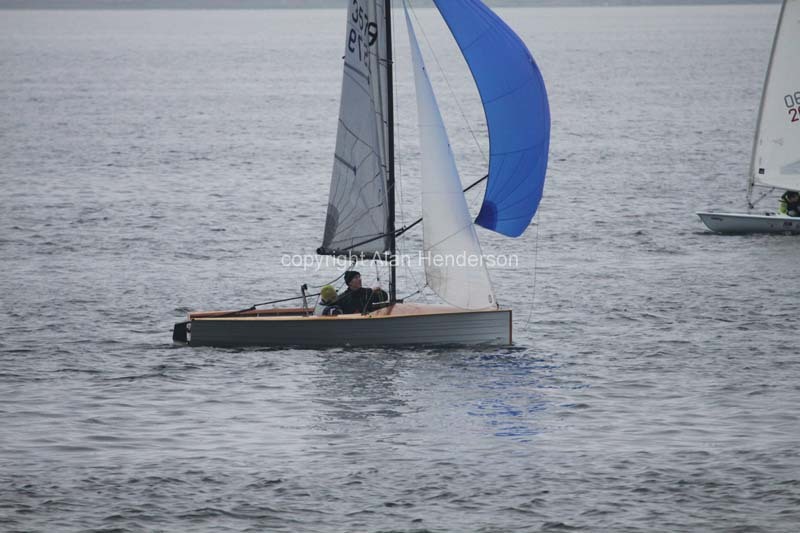 In all three races the stately Merlin Rocket, sailed by the McMillans, from the Isle of Bute, also managed to break through into clear air and revelled in the conditions, winning the event. 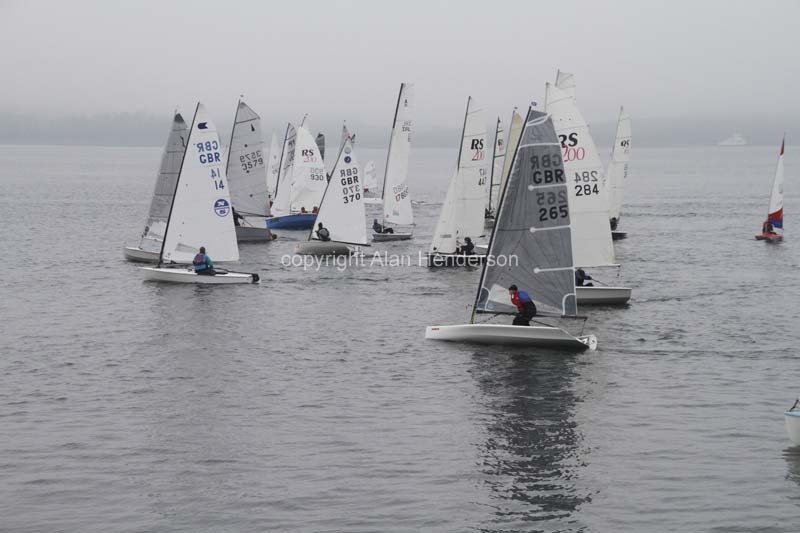 All three races were closely fought with plenty of boat to boat action and mark rounding antics. The 'mini fleets' of Solos, DZeros and RS200s seemed to sail in packs - often with only seconds between them. The visiting Albacore, well sailed by Crawford Reid, also enjoyed the conditions and always featured in the leaders of the chasing group. She was second overall, with the Solo of Kevan Gibb third, the event proving that traditional designs are still extremely competitive in the right hands. Many thanks to Avril, our club steward, who arranged for pre race coffee and rolls - and a welcome lasagne, chips and soup to warm folk up after the races.